Franziska was born in Basle to a businessman father in an artistic family where her brother was the painter, Niklaus Stoecklin. She moved to Germany in 1914 where she became a student of art. 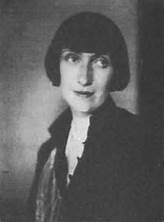 She married at an early age and became a painter and author living in Munich, Frankfurt and Berlin but she parted from her husband and moved to Tessin, where she was encouraged by Rilke. Her poetry addressed themes of Dreams, Love, Death and Nature and were first published in newspapers and magazines but assumed book form in 1920 in "Gedichte", mainly addressing themes of Love in a passionate style, and, in 1925, "Die Singende Muschel", in which themes of Death tended to predominate and be addressed in a more direct style. She tended to avoid rhyme and to choose an almost surreal and stylised mode of expression. She died at age 36 in Basle having fallen into mental decline.